It’s a turbulent time for rebellion. The power of the empire/first order increases day by day and the small band of rebels is scattered all over the galaxy to promote their cause. Star Wars: Join the Rebellion or the Empire? How do I create a Star Wars costume of the light or dark side and much more? A lecture with costumed fans for fans in cooperation with the two biggest Star Wars costume fan communities of Germany’s Rebel Legion – German Base Yavin and 501st Legion German Garrison. In addition to general information about the fan groups, e.g. What do the two fan groups do? Since when do they exist? How many members do they have? Is there any information on making a movie-like Star Wars costume? 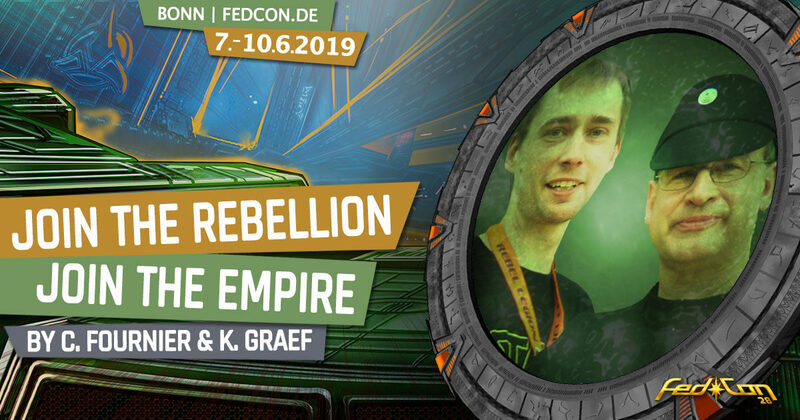 An informative overview at FedCon with Christoph Fournier and Karsten Graef. Christoph Fournier is a member of the 501st Legion German Garrison and since 10 years chairman of the sponsoring association of the German Garrison and will take over the part for the "dark side". Karsten Graef was in command for the Rebel Legion - German Base Yavin for five years and we took over the part for the "light side". Even though both have a preference for the contrary sides of Star Wars, the Empire and the Rebels, both are united in their passion and enthusiasm for Star Wars. The 501st Legion is the world's largest Star Wars costume club with over 10,000 active members around the globe. The German Garrison has over 900 members. It is home to Darth Vader, the Stormtrooper, the Bounty Hunter, Kylo Ren and General Hux. The German Base Yavin is the German group of the worldwide represented Rebel Legion. Here one finds exclusively costumes of the bright side of the Force, the "good", like the Jedi, senators, rebels and of course the heroes of the saga: Han Solo, Luke Skywalker, Leia Organa or Rey. 501st Legion and Rebel Legion belong to the three fan groups officially recognized by Lucasfilm.